Semnox Solutions has successfully enabled GRS Fantasy Park in Mysuru, India, to switch to an entirely cashless system. 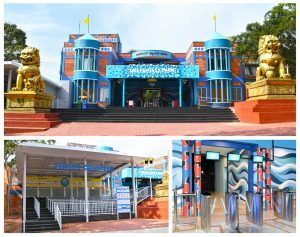 The venue is a family water park and is one of the top tourist destinations in the southwestern state of Karnataka, with over 40 rides spread across 40 acres. With Semnox’s Parafait suite of products, GRS has moved from cash based ticketing to an end-to-end RFID-based cashless system. Doing away with the manual cash and carry ticketing process at the entrance as well as the various counters and concessions throughout the park has simplified guest access. An online ticketing module helps visitors to book tickets online and RFID cards facilitate entry to the park. The access gates at the entry points feature the Semnox digital signage solutions with displays that guide guests to various attractions along with displaying advertisements detailing offers and packages. “We began this journey of overhauling our ticketing systems over a year ago,” said Ashwin Dange, business head, GRS Fantasy Park. “Before we decided on Semnox, we did a lot of research about the various service providers in the industry, from Indian to international players. Now, I am glad to say that we chose Semnox. Silicon RFID wristbands give visitors access to the main entry turnstile and at the virtual reality 5D-Ride. They also enable cashless transactions at the F&B outlets, rental, retail, and locker counters inside the park. These customised wristbands ensure easy readability even in tough ambient conditions. “GRS has been very clear from day one with their requirements of wanting to streamline their operations via a single integrated system like ours. This clarity enabled Semnox to provide an excellent solution with smooth implementation on site. “From day one, GRS has been an ideal partner and we look forward continued successful partnership. Semnox is grateful to the whole team of GRS for the support and managing the change so seamlessly. We are happy to welcome them to the esteemed list of clients we have” said Umesh Prabhu, director, Semnox. GRS is also poised to introduce the Semnox Parafait system in its Snow Park that will be launched by the end of 2018, adjacent to its existing facility.